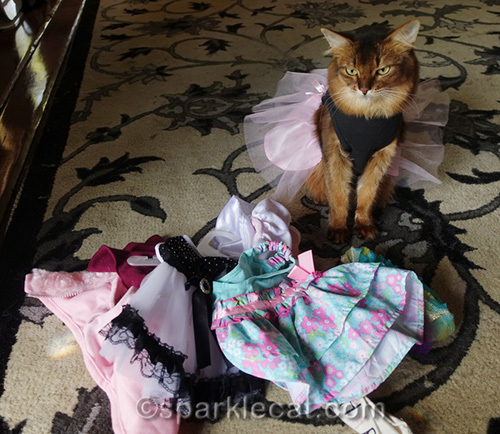 When we left off yesterday, I was choosing which outfits to bring with me to the BlogPaws Conference. I’m not going to be wearing something the whole time I’m there. Unlike my human, I have the option to go naked (except for my harness, of course!). But I still want to dress up sometimes. People expect it of me, and I enjoy it. The first thing I need to think about is the weather. It is going to be considerably colder in Kansas City than it has been in Los Angeles — it even snowed there over the weekend! I hear that while I’m there, it will be mostly highs in the upper 50s. So I think the pink sweater coat on the right will be too much. I can probably get away with the lightweight maroon sweater on the left. Choosing my casual wear was pretty easy. I’m bringing my new aqua dress, and an older favorite — my cute hoodie by Ellen Degeneres’s ED by Ellen pet line. Now here comes the hard part — the party dresses. I don’t want to overpack, so I can only choose one of these. 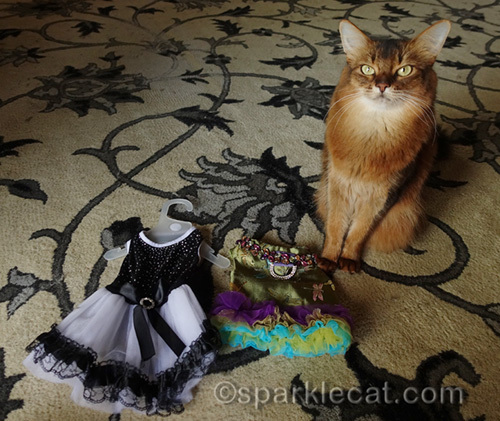 And this one is even tougher — I have to choose a dress for the red carpet and Nose to Nose Award ceremony! The black and white dress is a favorite of mine. 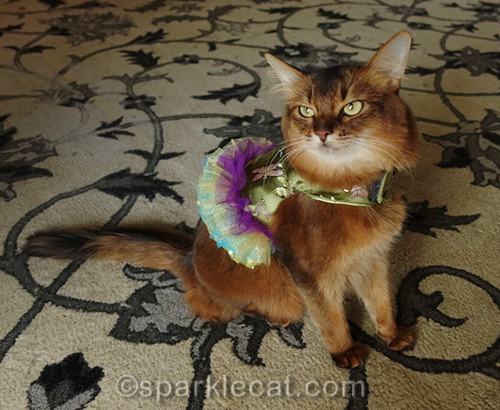 The green outfit is a hand-me-down from Coco the Couture Cat. Let me try these two on for you. The skirt to the black and white dress is stiff and flips up when I walk, so it is extra flirty. But the green one really sets off my eyes. What do you guys think? Which of the festive party dresses should I bring? Pretty much everything else is packed, but I want to hear your opinions before I decide! Dear Summer you will look STUNNING in any of your dresses – or even in “the altogether”! Your fans and friends just want to see you no matter what you’re wearing. I know my Mom would love to be there in purrrson to meet your human AND you! Have fun………I hope there’s BACON! 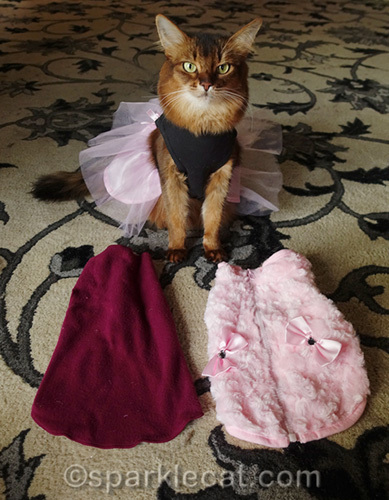 Pretty outfits for a Pretty Cat!! I luv em both, but da green does set off your eyes. Tough decisions…but I think I like the green party dress. Hope you have fun at Blog Paws. 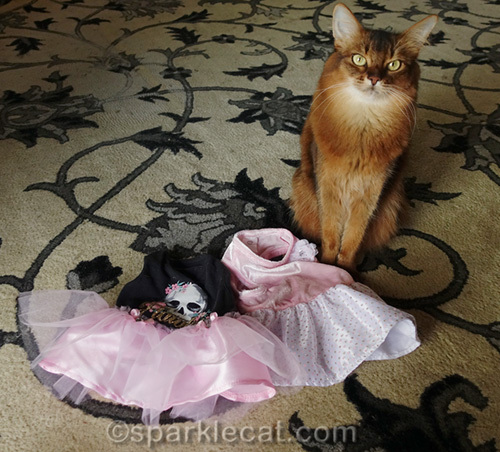 So many kitties and humans look up to you for fashion trends Summer; we expect to see the photos from BlogPaws with you in different outfits. Have fun. The black and white dress makes you look more elegant. 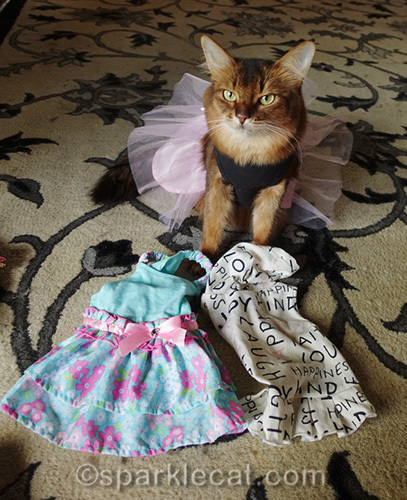 Youâ€™re gonna be one of the best dressed there, Summer….both human and pets. I think you should bring the pink coat. You don’t go to many cold weather cities. I’m partial to the skull dress and the hand-me-down but as I’ve been told, I shouldn’t say anything since I won’t be there. My Mom needs the adult version of Garanimals to get dressed, so she would not be of any help. I’m a classic black sort of gal, but that colorful dress is pretty too. Oh, I guess I’m no help either. Whichever you decide will be perfect! Gosh, we can’t decide! Are you sure you can’t squeeze in both? I would say the black one for a more formal setting like the awards banquet 🙂 You have such pawsome fashion sense! I’m with you in your choices and reason. 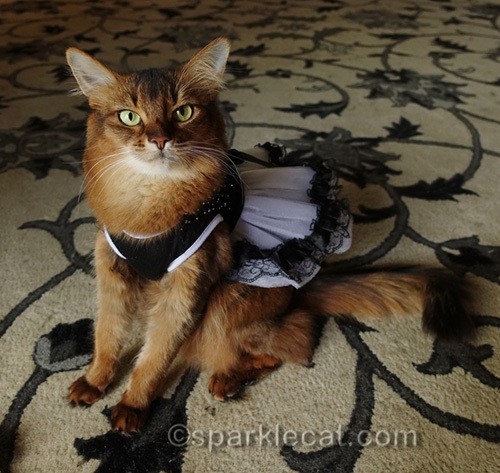 If it is comfortable for you, Coco’s former dress looks mahvelous. Otherwise, I like the black and white one, we haven’t seen it in a while. The green one is our favorite! We know you will make the perfect choices, Summer! We do like that last, green dress a lot, though! Summer, you’re going to be the hit of BP regardless of what you wear or don’t wear! We wish you both safe travels and hope you have a great time! PeeS: This is the latest your human’s tax return has ever been done! We’re glad she made the deadline though! Totally the black and white! VERY flirty if the skirt does that. I would love to see a video of you in it. Walking. Guess what? While in the University medical Center this morning I saw a lady and gentleman with a gigantic cream colored mass of fur. I went straight to them and asked if that was a therapy dog and it is!! A Labrapoodle. HUGE! I showed her Summer on Katie’s blog via my phone. I asked if she knew there were therapy Cats too. She said yes, there are two there at the Medical Center. Isn’t that COOL!? Summer, your dresses don’t take up much suitcase room, so bring them all! the green one does accent your eyes but i think i like the flirty black one. Such a tough choice! We’ll always love the black and white flirty dress, but that green does work with your eyes. Our Mom always is reminded to remember layers. You can always take something off, but you’re not a human planning on wearing two party dresses under a sweater under a coat at the airport and during your flight. We say, Mom, you’re not helping. Have a fabulous time at BlogPaws! Definitely pack a light wrap Summer. OMCS everything you have on display today is purrfect. We vote for the green one! Our mom can’t wait to see you and your human. I hope she does a better job reporting than she did at the cat show! The black and white. You’ll look stunning in either one. Have fun! I like the black and white one, you look the most comfortable in it. Beautiful in all of it or nothing! Your clothes are so small that you can take them all. 🙂 I agree the green brings out the color of your eyes. You can’t go wrong pretty Summer, you’re stunning in both!!! Definitely the pink and black (even tho I do not understand the whole ‘skulls as decoration’ thing) and also the other black and white dress, the green one doesn’t look like it fits very well and it’s much to fussy. The green one is really pretty, but I think I like the black one the best. No wrong choice here, but… we think the black and white one. Enjoy the trip! Oooo… Both are gorgeous on you! We think the green for the fun tutu and it’s playful and glam! Both look great on you. We would probably choose the green to set off your eyes.